I do not like to put the names of minors on the Internet but my daughter feels strongly about this contest so here I go. This is my daughter China Khoral she is in a song writing contest. She sang, composed the music and wrote the lyrics for the song for this. If you like the song please go put a like on her song. This is to raise money for cancer research th etop 20 popular vote tgo to the next level where 12 are picked to be in the album to help raise money for cancer reasearch. Her grandmother died at the end of my daughters 7th grade year from pancreatic cancer. Not long after ward so did her great uncle from testicular cancer and her great grandfather the previous year from cancer of the blood all from different types of cancer. We had lived with the grandmother at one point in my daughters' life and she was more like a mother to my children than a grandmother. Life has trials and they make us strong I consider my children to be some of the strongest people I have known. They face life head on and are resilient. This song is about the trials my daughter went through during the time of her grandmother passing and her other relatives which was during a time she was being bullied at school. She is an amazing young woman. I hope her song gets picked to be one of 12 on the album so she can help others through her music and be able to donate her energies to cancer research by the money the album will raise. Thank you for your time with this. This is what she has written about her own song. “Girl I Wanna Be” is about when I was being bullied through the end of elementary and throughout junior high. I was judged because of my personality, the way I dressed, and the fact that I liked to do what the boys did. Towards the end of my seventh grade year I was physically bullied by a boy twice my size. I was injured in such a way that my feet were two inches out of alignment. This was what broke me and taught me to forget what other thought and just be me. A year ago I started taking composing lessons and made the choice to tell my story through music. I hope that through this song others may be able to stand, let their flame burn, and be the person they wanna be. This is my song for life. The Girl I Wanna Be lyrics written, music composed and sung by China Khoral if you like it please hit like on the facebook like link in the contest page we would greatly appreciate that. September 15-November 15: Upload your original song or your version of a cover song, a photo and a short description of your song. September 15-November 30: Social Media Sharing and voting. Share your song with your family, friends and on social media. Highest number of Facebook likes determines the top 20 candidates. December 1: Final selections of 12 winners will be announced by the Songs For Life Review Committee. Winning artists will be posted on the site. One additional winner with the best “I Am Not My Pain” version will be selected for this year’s album. Twelve winners will be given up to $2,000 each towards recording studio fees at Soularium Studios in Alpine, UT if needed. Winners will also be allocated up to $1500 in travel expenses if needed. Final production to be completed by January 31, 2015.
thank you all that helped my daughter with her song and the contests the positions changed a lot in the end they took the top 25 because everyone was moving so much she was number 26. So yes she was real close thank you all so she does not get to go to the next level 29 votes more and she would have been in. Thanks for all the help it was fun to watch and see all the help. 81 songs were entered and she was going against a lot of adults a good effort on her part and all of you thank you so much. Hope your day is full of joy, friends and family. 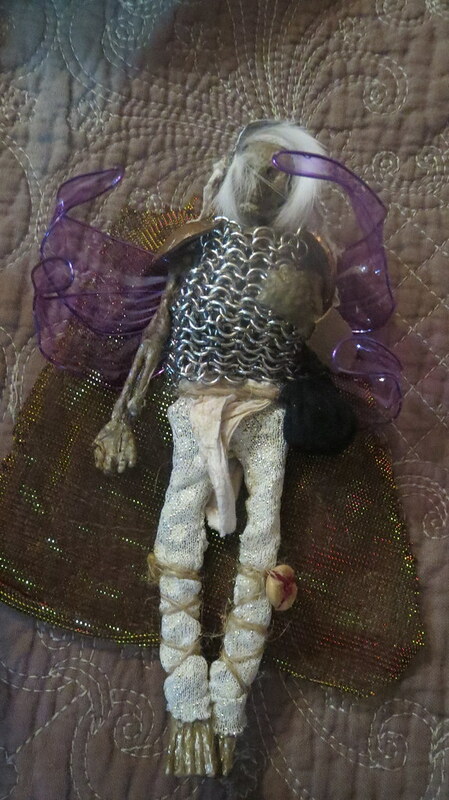 My middle daughter during the summer made this Knight in shining armor for a friend of hers. We forgot to take photos before she gave it away. Recently she was given access to this item again. She was excited that we would now be able to take photos of the item as it had a lot of work involved with making this fairy. This was probably the most elaborate fairy she and I have made together with over 100's of hours in the making of it. May not look that way to people looking at. Usually this would be posted on my daughters blog but she is debating on getting rid of her blog and just joining my blog as a guest blogger. 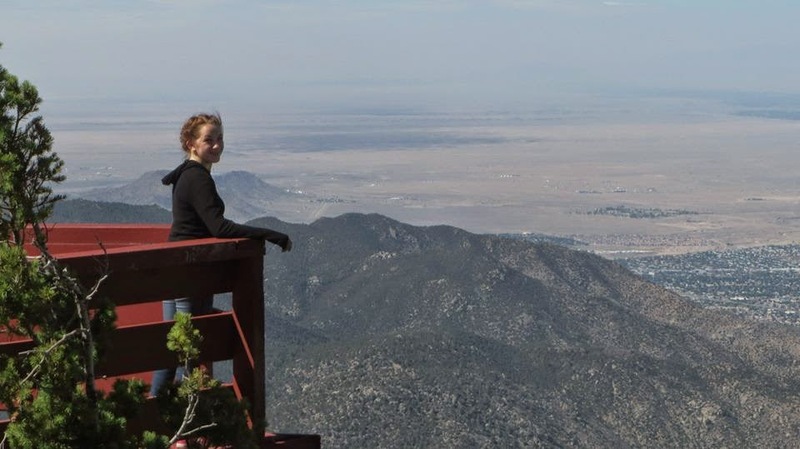 With school and such and health issues she figures this would be better in the long run. 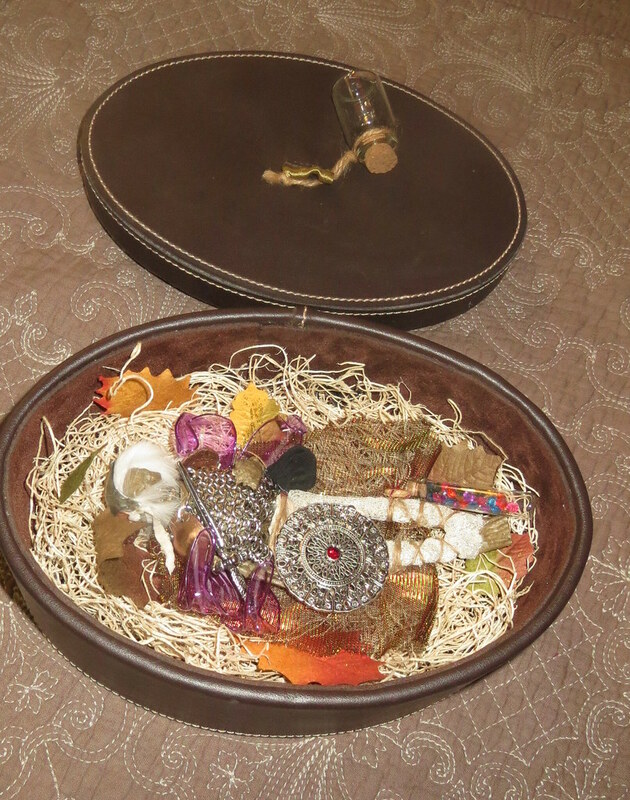 The box that that was used to house the fairy was found thrift shopping. The little jar that is tied to the top of the box was purchased at Hobby Lobby. Originally it had the recipients name in it. 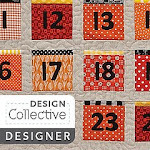 But we did not want to show the name on my blog for privacy reasons. It is now a very cherished family item. 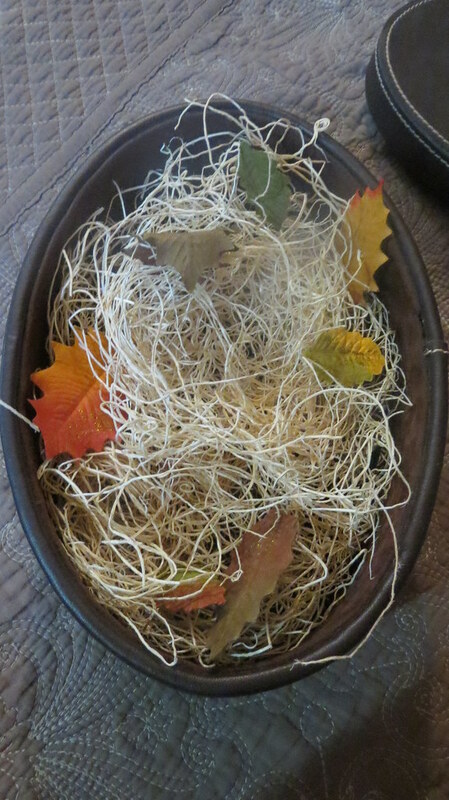 The inside of the box is set up with grass and fall leaves. The fairy has some accessories with him. 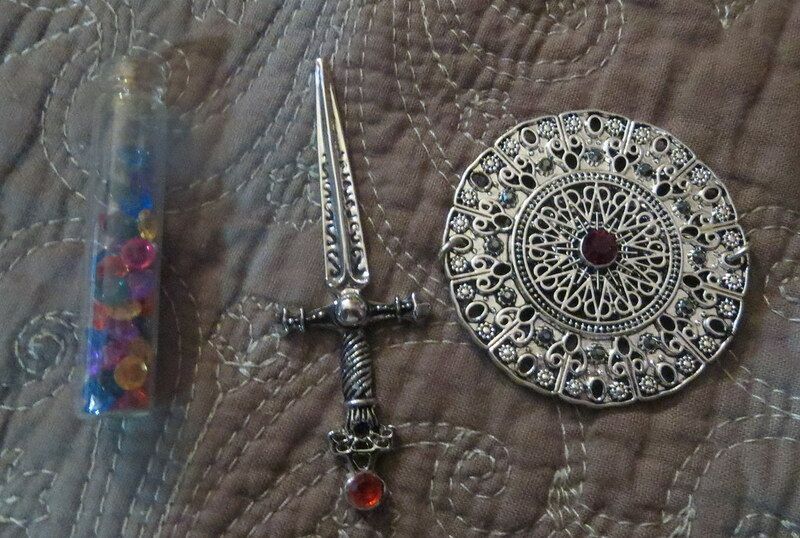 A sword a shield and a jar of coins and jewels. The jar was purchased at hobby lobby as was the weapons. 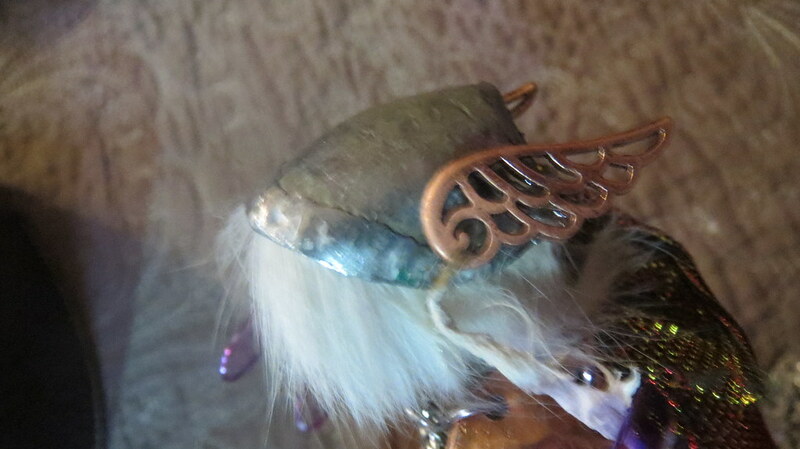 But the weapons originally were necklace charms that we modified for our own ideas. 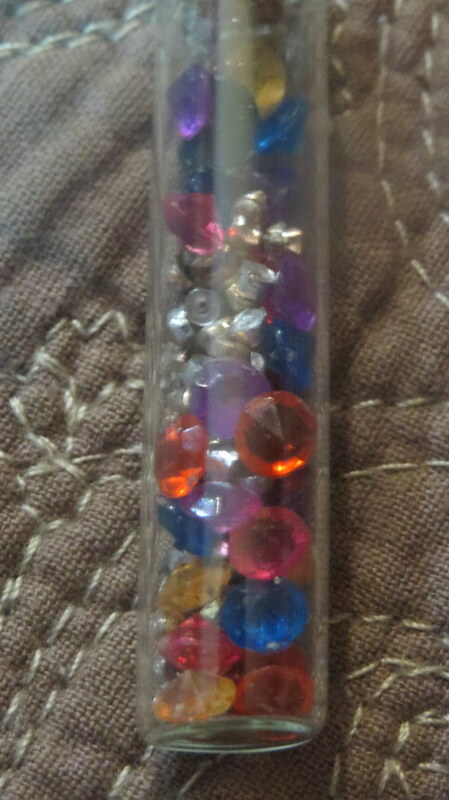 The jar of gems and coins was made out of and old bracelet that we took the gems out of and added to the jar. The coins in the jar are actually made out of a dime and a penny that we took a hole punch too to make coins the correct size for a fairy. Took many hours to make those coins. The armor was hand made mostly by me and my daughter. The shoulder armor pieces are two pennies that I hammered into the desired shape on a small metal rod that I used like an anvil. When I had them to the desired shape I used the same hole punch that i used to make the coins to make the holes to attach it to the chainmaile. Then added those four coins to the jar of coins too. The knights hair is a small piece of rabbit fur left over from the costume of Puck from A Mid Summer Nights Dream. 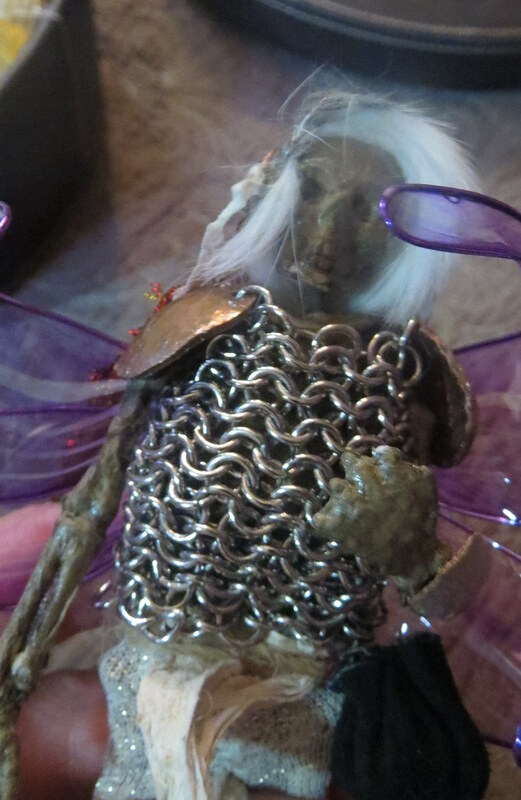 The little bits of fabric used on this Fairy is also scraps from other characters from mid summer night dream. The cape is from mustard seed and the shinny loin cloth is from moth. There is a little strip of leather she placed over the loin cloth. She also made a little black bag that was to carry little fairy items what ever they might be. 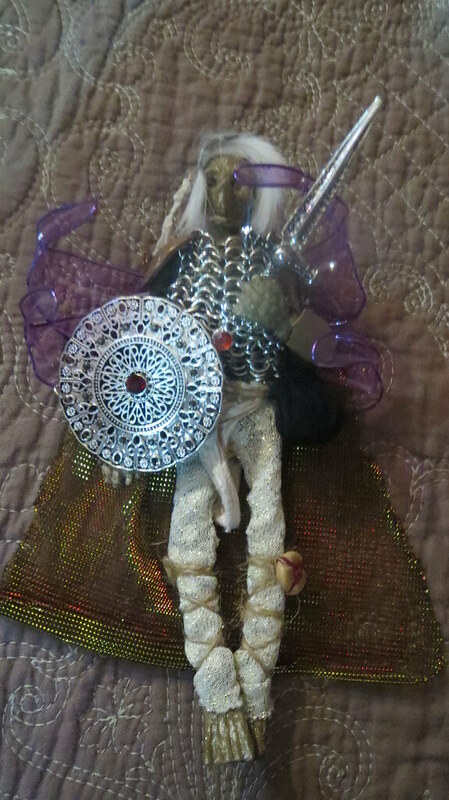 There is little pieces of twine wrapped around his legs and one has a bone button on one leg as if the fairy had found it and liked it so much added it to his clothing. 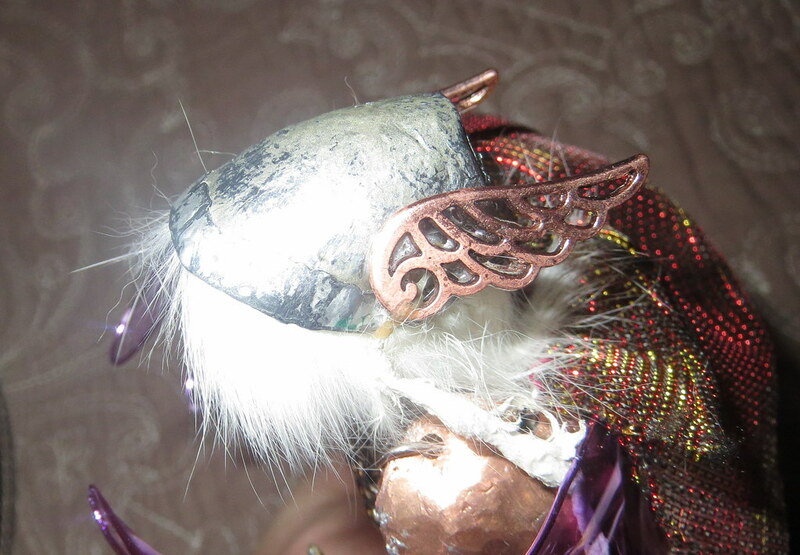 The wings are made out of a butterfly that is supposed to be used as a hair clip. My daughter dismantled it ( removing the clip, antenna, and butterfly body) and reconstructed it to be in the shape she wanted for the fairy. The helmet I made for the knight. It is made out of a Jarritos bottle cap. It was the soda that we had at my daughters 15th birthday party the cap was left over from that party. I did the same thing to this hat as I did to the pennies. In that I took a hammer to the cap till it was flat then I made a make shift anvil and shaped the piece to the knights head. It took about 8 hours to get the shape I wanted. 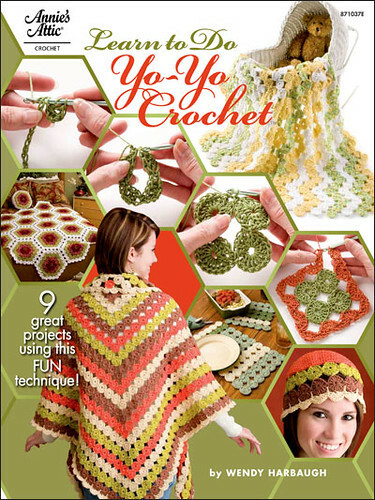 I sat on the front porch working on this it was fun to do as random people walked past in the middle of the summer they would come over and see what I was making. 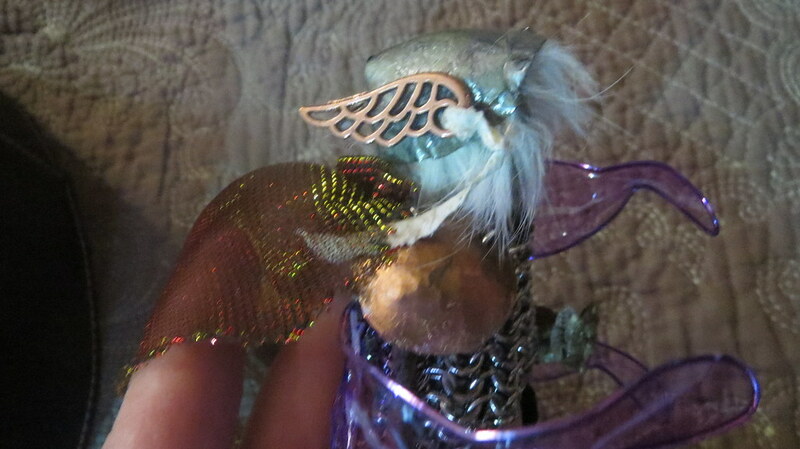 The wings are some pieces we found at hobby lobby that are meant to be used for scrape booking but we thought it would be fun to have a Mercury look to the hat especially since the fairy already had wings. 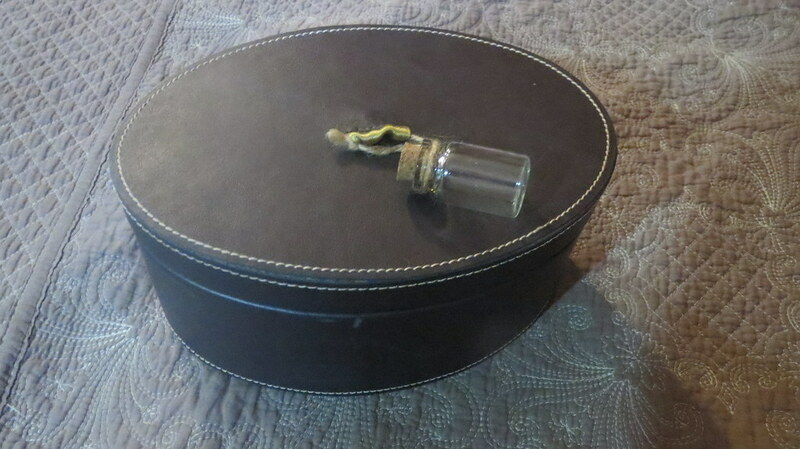 There are little pieces of leather (scrapes from the rabbit fur) tied to threw the holes I punched into the hat as I did the pennies ( adding the punches to the the jewel jar). I have made a few corsages and boutonnières for tonights homecoming dance. My daughters are going stag. So the other three you see are for some good friends of theirs. One is for a first date that is the green set. The other is for a good friend who doesn't have a date also. So we thought we would do something for these three friends to make it more special for them. 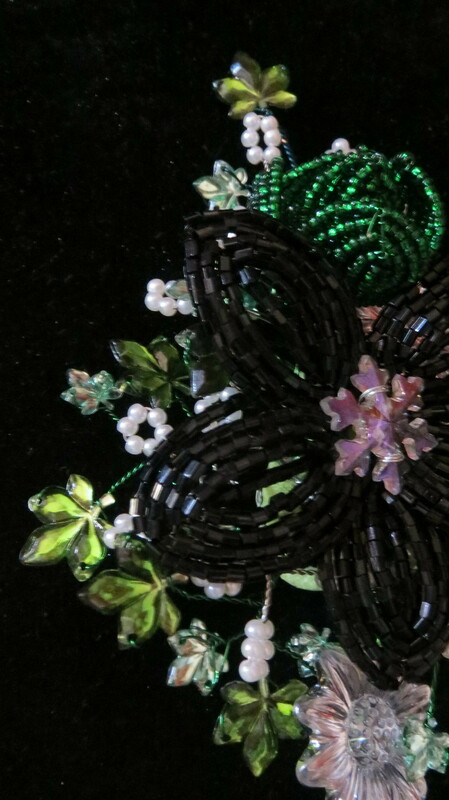 Since the theme of the dance is " Night in Paris" We figured French beaded wire flowers was perfect as a special keep sake for the dance for everyone including my kids. This is the one I made for my middle daughter. Hers is the dress that was white that I modified. Since her dress has snowflakes on it we thought a sort of winter theme would be good. The pink was added so it could have a little pop of color. The snow flake are actually buttons. 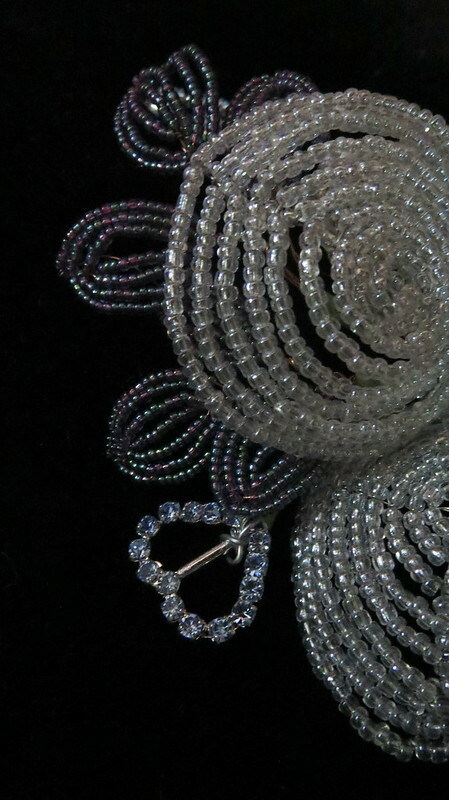 The lavender hearts are actually little rhinestone belt buckles. 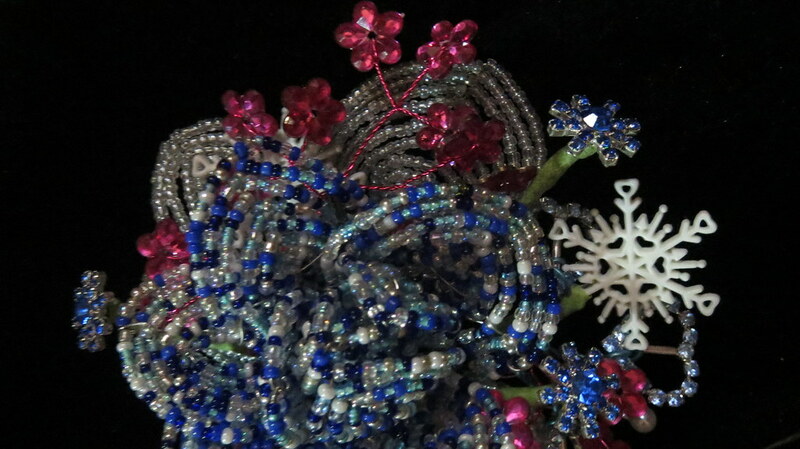 The blue snowflakes are rhinestone buttons. 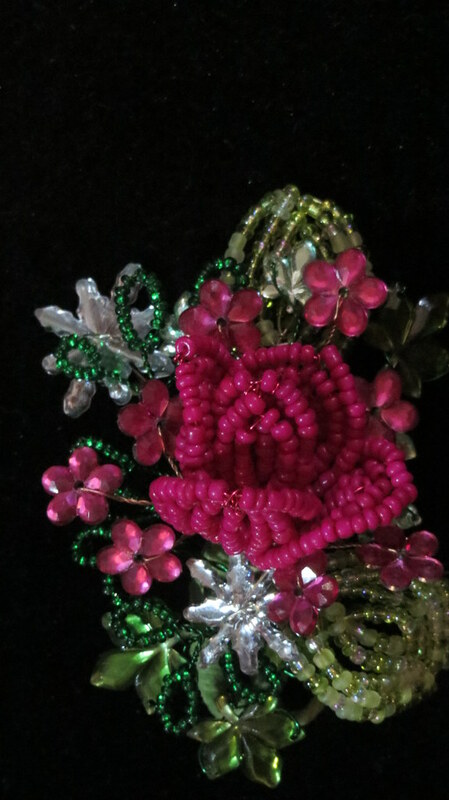 The pink flowers are sequins. And the rest is made out of wire, seed beads and tape. 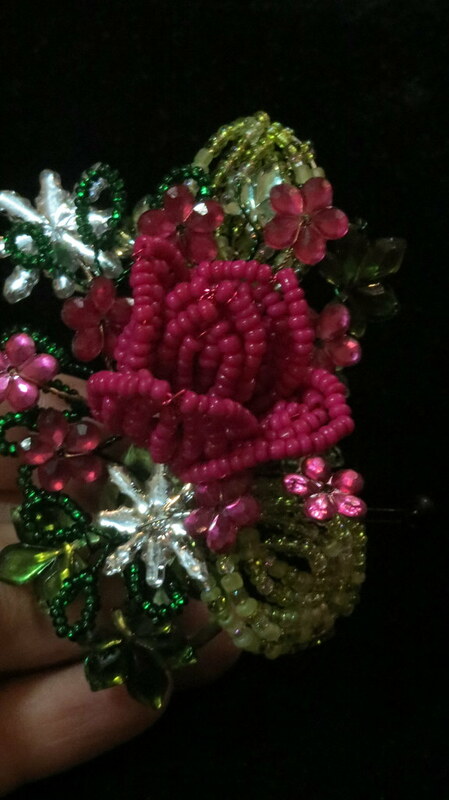 This is the heaviest out of all of the corsages that I made. 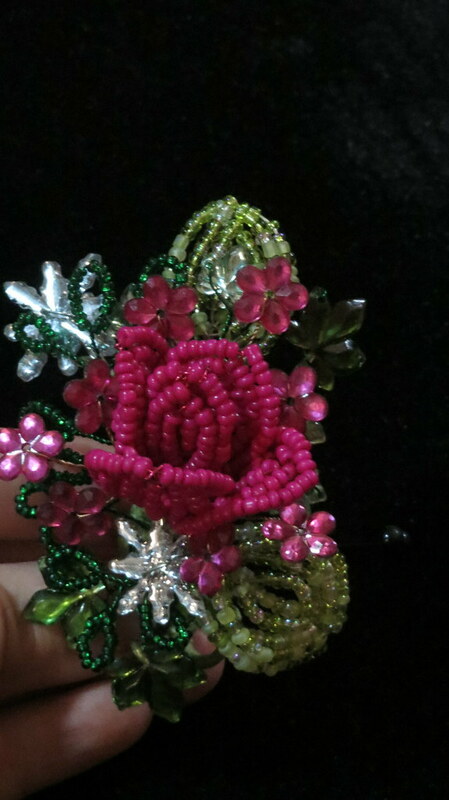 My daughter is fine with that as she really likes French beaded flowers. My oldest daughter made the white beaded leaves. They were originally going to be a gift for me. She was going to made me a beaded orchid plant. But after two years of it sitting in pieces I reclaimed my beads and her work so it could be made into something useful. My middle daughter was happy to have this corsage because it represents two family members work. 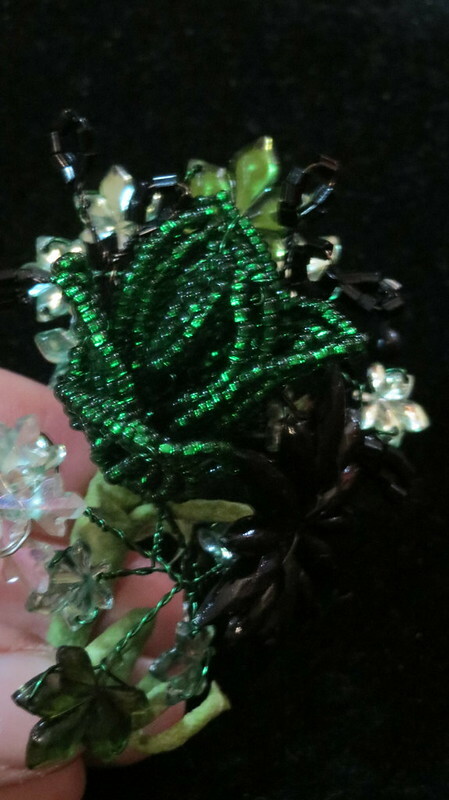 This is the corsage my oldest daughter will be wearing. This is one of two orchids that actually got made. 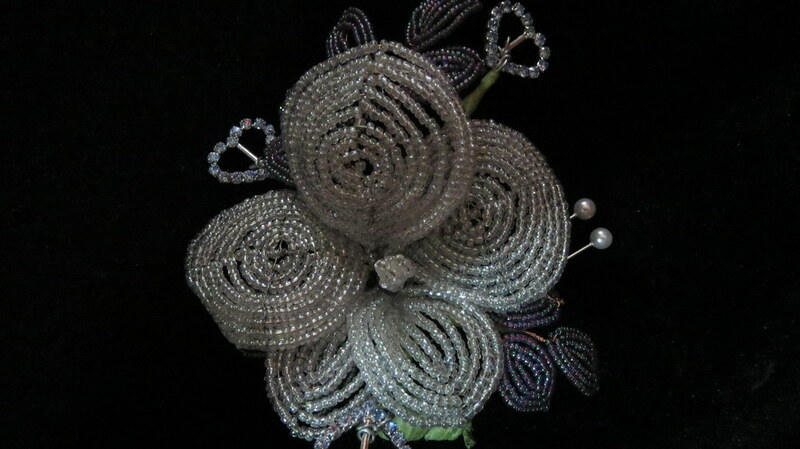 The other I made into a corsage and gave to my mother in law at mother's day. I will see if I can get photos of it at a later date and post. She was excited to see that I had made her flower into a corsage for her. She felt a little bad that I never got the orchid plant. 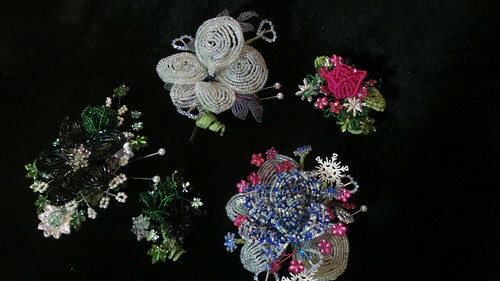 But I am not sad my kids will get more use from these corsages than I would a beaded plant I would have to dust. Plus I still get to enjoy them but on three people now and I know how much work went into making them so I still feel her love for me. My youngest daughter helped me wit this one. One day she was home sick from school instead of just sitting in bed going stir crazy she beaded all the lavender micro beads that I used for the leaves. 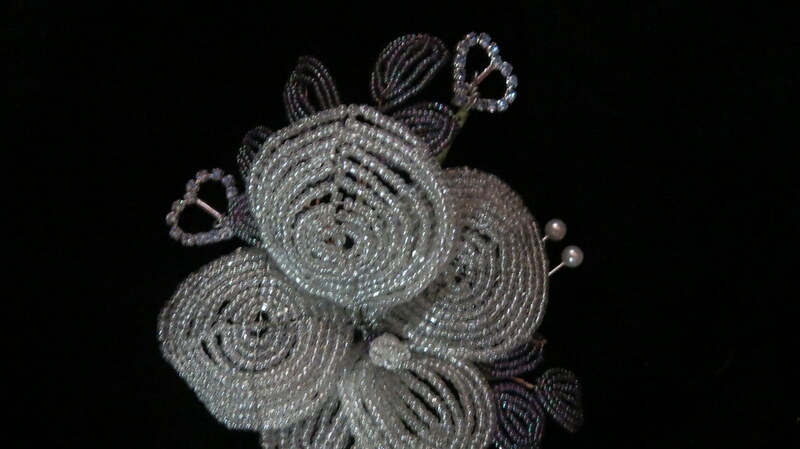 I also used the lavender rhinestone buckles in this corsage too. This one is for a two friends of my middle daughter who are going on a first date. Not only is it a first date for each other but their first date with any one. So I wanted to help out and make this for them. 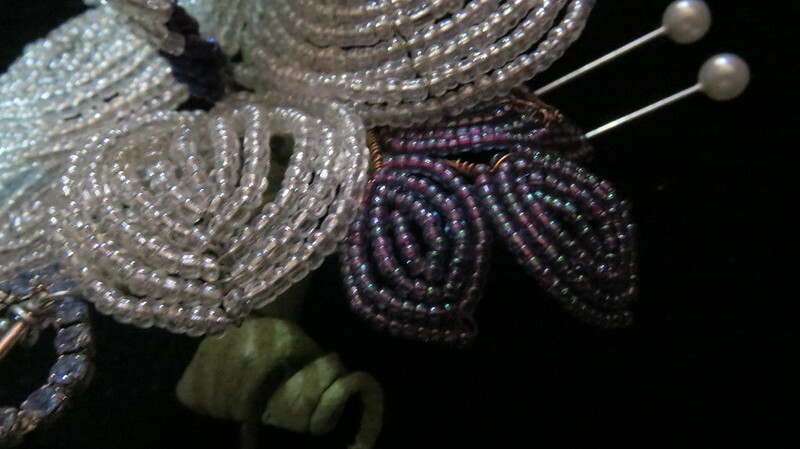 Glass seed beads, sequins and imitation pearls for baby's breath. The girls favorite color is green and her dress is black so this is what I came up with. Because I used so many sequins this is the lightest one I have made the others are much heavier because of all the glass seed beads. 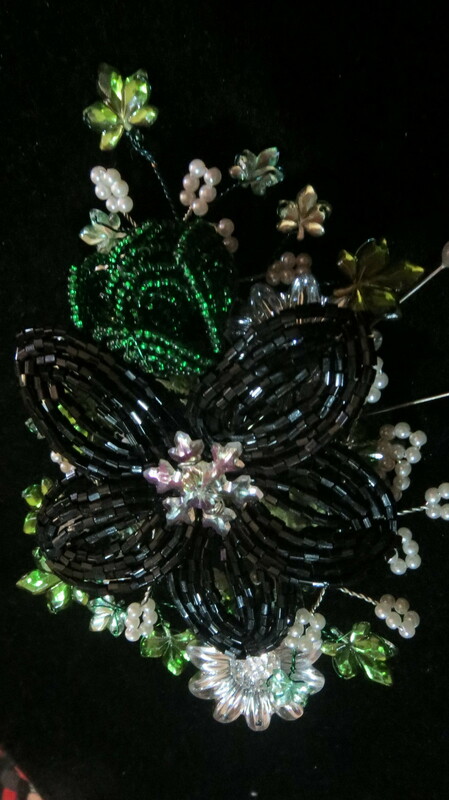 My kids do not mind the weight they expect beads to be heavy but others do not expect that much weight in a corsage so I was trying to make it lighter for them. 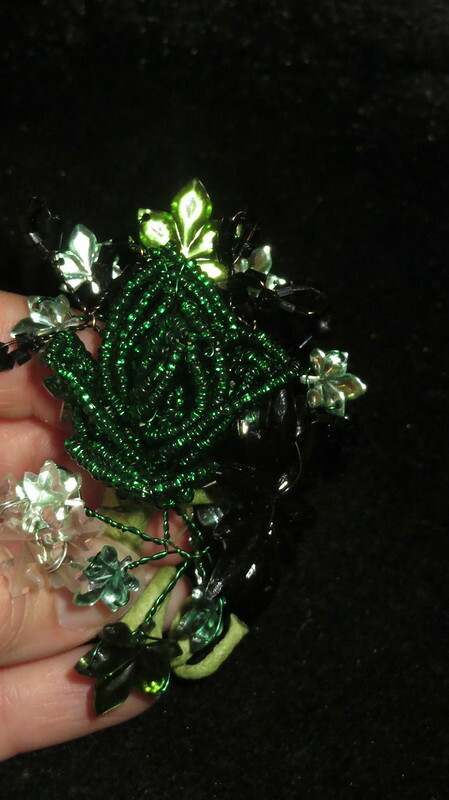 This is the boutonnière for the guy that matches the corsage above. 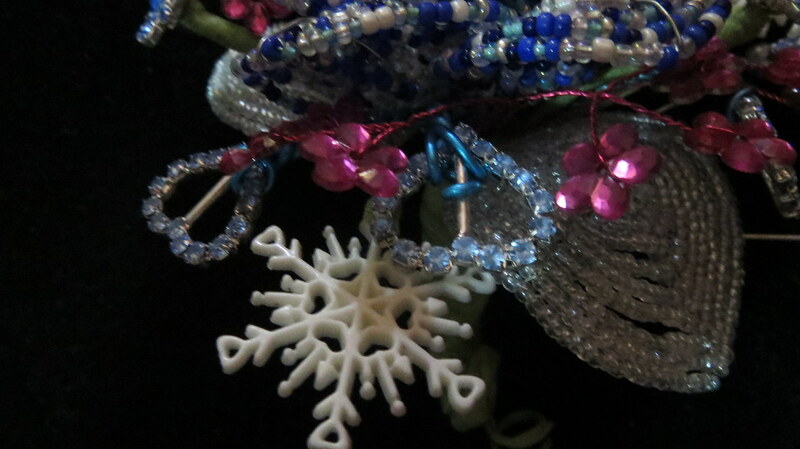 I used similar beads minus the white baby's breath look I used the black seed beads instead. I like that they match but are still totally different. His is also very light in weight. The pink boutonnière is for another friend of my daughter who is also going stag to the dance. But he does not like to wear flowers so it may not ever end up being worn by him if he does not want it. You ask why pink well it is his favorite color so we did it hoping he would like it enough to wear it but he probably won't. 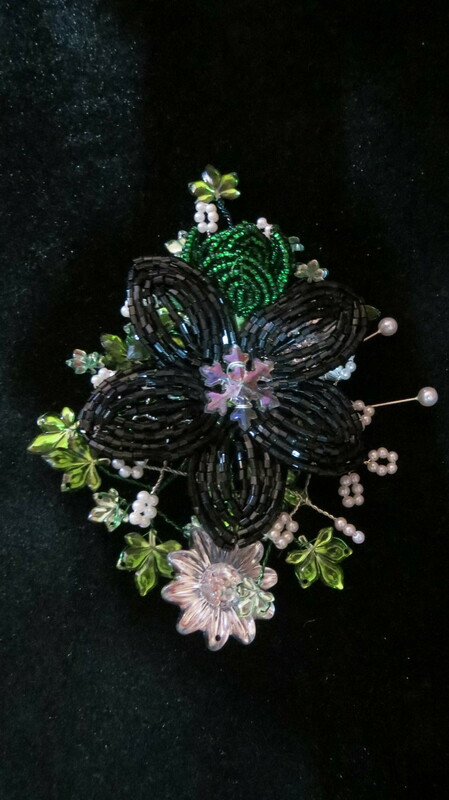 This is also a light weight one because I used sequins for the some of the leaves. I hope the students like them as much as I do. 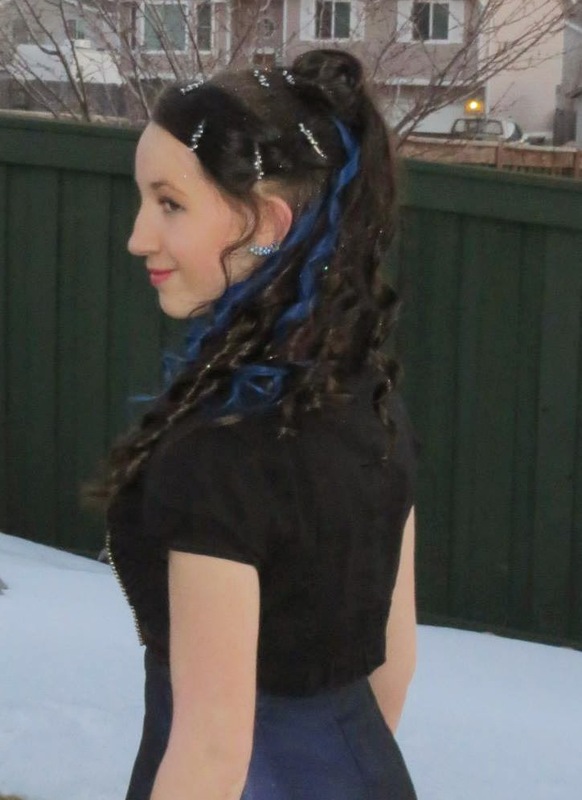 I also hope they all have a great night at the dance tonight. Update the green ones the couple loved, my kids loved theirs and I guessed correctly that the pink one was never worn as he hates wearing flowers. 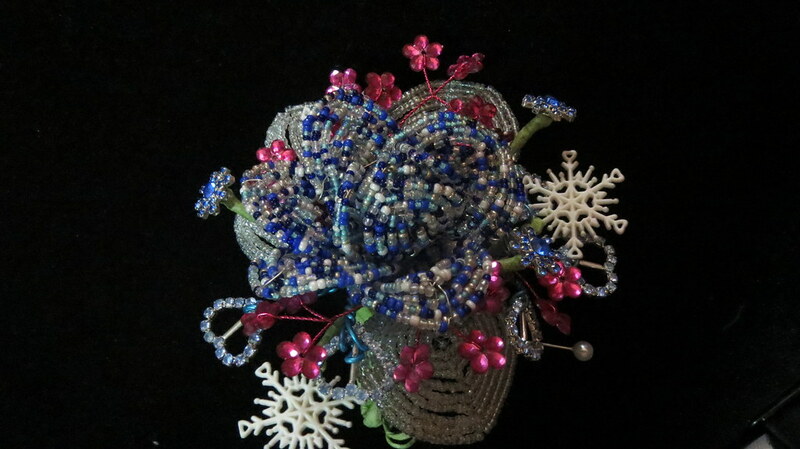 Another update my daughter gave this pink beaded boutonnière to her homeroom teacher for him to wear for thanksgiving. He liked it which made my daughter happy.